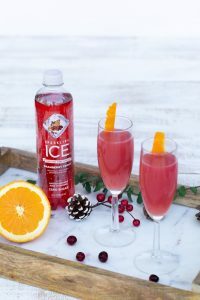 2018 December: Sparkling Ice has you covered! Check out some of these recipes! There are even some great mocktail ones! Sparkling NYE Cocktails are a must for New Years Eve! Sparkling Ice has you covered! Check out some of these recipes! There are even some great mocktail ones! In a tumbler, mix cranberry juice, orange juice and juice of half a lime. Add ice, shake and strain into your glass of choice. 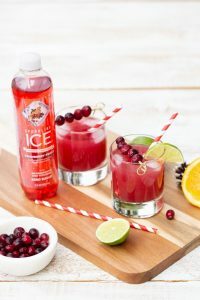 Top with Sparkling Ice Cranberry Frost and garnish with a lime twist. Put cranberries on a skewer and rinse under cold water. Dip skewered cranberries in water, then roll in granulated sugar. Place skewers on wax paper and place in freezer for 5 minutes. 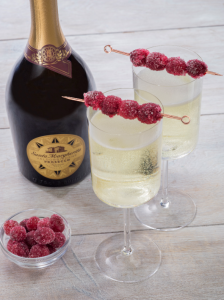 Fill glass ¾ with Santa Margherita Prosecco Superiore. Place skewers on top of glass and serve. **Optional: For a slightly sweeter garnish, soak fresh or frozen berries in maple syrup overnight, then skewer and roll in sugar. And now for a couple of Mocktails! In a highball glass, muddle cranberries. Pour in Sparkling Ice Cranberry Frost and cranberry juice. Add 4 dashes of citrus bitter sand top with apple cider. Finish with ice and an orange peel garnish. I actually can’t wait to try this one! 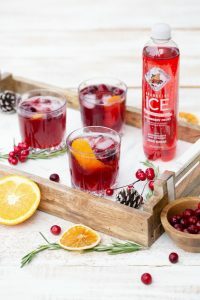 Self Disclosure: Thank you to our friends at Sparkling Ice for the great recipes! I received samples to post. Images and recipes were also provided. 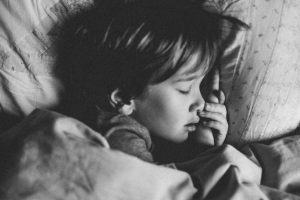 While choosing a mattress for your own bed can be an easy task, choosing one for your child can be a daunting one. However, it should not be overwhelming if you can focus on the basic features. Unlike yours, your child’s mattress should keep growing in size to accommodate his or her growth. Here are essential tips you could consider when shopping for your child’s mattress. The first task would be to determine your child’s bed size before setting out to buy a mattress. For instance, if the bed is a twin bed, then the mattress should be a twin mattress that fits perfectly. The age, weight, height, and health needs are the important guiding factors you should bear in mind. Changing a mattress and a bed every now and then for your child can be costly. Therefore, it is essential to purchase one that can be used for a long period. For instance, if your child is 3 years old, the mattress should at least serve its purpose until his or her 6th or 7th birthday. Check the details here for an in-depth twin mattresses guide for your child. A child will always be a child and it will be good to ensure that he or she gets to enjoy the childhood phase. When choosing a twin mattress, check for its design. Usually, mattresses have standard rectangular or square shapes, but they differ in terms of design. Mattresses have different inner layers designed to offer the desired weight support and spinal comfort. For a child with special needs, the design plays a very crucial part. Moreover, you can also shop for a mattress that has colors your child likes. The mattresses are available in different color schemes from dark to light colors. Some even come with printed covers of cartoons or mosaic patterns. The important thing is to match the mattress with your child’s needs. Important Advice: The perfect mattress for your child should be resilient enough to prevent flipping or rotating. Children are sensitive to chemicals which can pose serious health risks to them. Mattresses that are made from synthetic materials should be avoided as they can cause skin irritations and allergies for your child. The perfect mattresses are those made from natural and fresh materials such as organic wool, silk, hemp, organic cotton, and natural latex. Before buying any mattress for your child, thoroughly read through the manufacturer’s manual so that you are sure with what you are purchasing. When it comes to buying a mattress for your child, it boils down to what you can pay. High-quality mattresses are very costly compared to the low-quality ones. But, the good thing is that you will not miss something that comfortably fits your budget and needs. When shopping, always give the store attendant all the details so that he or she can know what will suit your needs. Besides, do not overstretch your pocket if you cannot afford a particular mattress. What’s more, do not compromise on the quality. For twin mattresses, the price will range from $50-$1000. Bonus Tip: Never buy uncertified twin mattresses since they pose health and safety risks. How much do you know about Email marketing for your business? I have to admilt I am not an expert and it has taken me years to know what I do already know. Looking to start off the New Year with making your Email marketing for your biz more of a success? There are Do’s and Don’ts and if you check out this great infographic from Campaign Monitor you are sure to learn some really great tips for the New Year! I really find their Don’ts quite helpful in planning subscriber emails for 2019! I have to admit that I have been guilty of sending the same email to every reader on my subscriber list. I really didn’t see anything wrong when it when I first started blogging. But, now I know better! I wasn’t surprised to see it as a Don’t! So, do you have any helpful tips you would like to share? I know that I plan to keep all of the Do’s mentioned below this coming New Year! I really like #3 Do: Including attention-getting pre-header text to provide more context to your message so all readers will be encouraged to open my emails. So, now it’s time to get more creative with email marketing! So, following these Do and Don’ts is a great way to be more successful in your email marketing! What are your waiting for? Check out the infographic! Credit: Campaign Monitor. Self Disclosure: Compensation was received to post. Families Looking For New Year’s Eve Fun Need To Check Out Universal Studios Hollywood’s EVE Celebration! Universal Studios Hollywood rings in 2019 with EVE, Hollywood’s biggest and most exciting New Year’s celebration, including an all-new Ultimate EVE package, on Monday, December 31, with extended theme park hours to 2:00 a.m.
EVE is included in the price of theme park admission and invites guests to spend the day and night enjoying its many popular rides and attractions with a special park-wide party starting at 9:00 p.m., featuring multiple DJs and live music entertainment hubs, that will culminate simultaneously at midnight with a traditional New Year countdown and a spectacular fireworks display. The all-new Ultimate EVE package is a featured addition to this year’s event, inviting guests to celebrate in style. Package highlights include theme park admission starting at 6:00 p.m., access to private lounges, buffet dining, private cash bars, reserved VIP viewing areas for the dazzling fireworks display, a complimentary, midnight champagne toast, commemorative 2019 party favors and unlimited Universal Express access to all rides and attractions. Starting at 9:00 p.m., Universal Plaza, Simpsons Plaza located in Springfield™ and an area near “Revenge of the Mummy – The Ride” will transform into three uniquely-themed party hubs, featuring a variety of music, from rock ‘n’ roll to electronic dance music to Latin pop, and the celebration will continue with enhanced DJ shows and after-party entertainment until 2:00 a.m.
To purchase tickets for EVE or the Ultimate EVE package, click here. With its festive environment, guests can toast the New Year with the spirit of the holidays already resonating throughout Universal Studios Hollywood. The highly-anticipated return of “Christmas in The Wizarding World of Harry PotterTM brings glistening snowfall for the first time ever to Hogsmeade village along with “The Magic of Christmas at HogwartsTM Castle,” a breathtaking digital light projection experience, which continues through January 6, 2019. 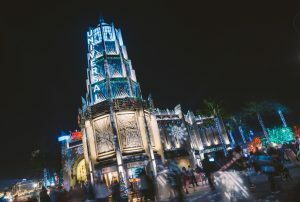 More information, including special EVE Preferred Hotel Packages, is available at www.UniversalStudiosHollywood.com. Like Universal Studios Hollywood onFacebook and follow @UniStudios on Instagram and Twitter. Credit: Universal Studios Hollywood. Photo credit: Mike Danenberg / Universal Studios Hollywood. Newport Dunes Waterfront Resort welcomes a star-studded country music lineup for their second annual Boots on the Beach New Year’s Eve celebration on Monday, December 31, 2018 from 5 p.m.–1:30 a.m. 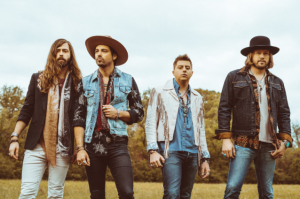 Kicking off the new year in country style, nationally touring headliners, A Thousand Horses will be joined by popular ‘90s rock-turned-country band, Lit, along with local country favorites, Redneck Rodeo and Temecula Road. Bring family and friends for an evening of celebration featuring live music, food trucks and full bars, plus country western merchandise available for purchase. The event will take place in the 14,000-square foot Bayside Pavilion tent with David Bugenske from Go Country 105 as host and DJ for the evening. Before the show, Kristen Ann, one of Southern California’s top line dance choreographers, will teach the crowd all the right country dance moves. Come just for the concert, or make the evening extra special and enjoy dinner before the show at Newport Dunes’ picturesque waterfront restaurant, Back Bay Bistro. The Boots on the Beach VIP dinner package offers seatings from 5-7 p.m. and includes a mouthwatering four-course New Year’s Eve dinner along with VIP concert seating. For a more intimate evening out, dinner reservations are also available without the purchase of concert tickets, with a first seating from 5-7 p.m. for $65. Also offered is a festive second seating starting at 8 p.m. featuring a 5-course dinner, party favors, live DJ, and a champagne toast to ring in the new year on the bay for $125. For reservations, please call 949.729.1144. Make the weekend one to remember and rent one of Newport Dunes’ many beachfront cottages available onsite, just steps from the concert. RV and tent camping options are available as well. For those choosing the VIP Back Bay Bistro Dinner and Concert package, a three-course meal is included. Seating: 5-7pm. Boots on the Beach NYE: 5 p.m. – 1:30 a.m.
Back Bay Bistro NYE Dinner (VIP Package Option): 5-7 p.m.
*All ages welcome. Children 10 years and under receive free admission. To purchase tickets to Boots on the Beach New Year’s Eve, please visit: TicketWeb.com. To make your New Year’s Eve dinner reservation at Back Bay Bistro, after purchasing tickets online, please call (949) 729-1144, or email ggasperino@newportdunes.com. For more information on events and amenities at Newport Dunes Waterfront Resort, please call 949-729-3863 or visit NewportDunes.com. welcomes a star-studded country music lineup for their second annual Boots on the Beach New Year’s Eve celebration on Monday, December 31, 2018 from 5 p.m.–1:30 a.m.
Credit: Newport Dunes Waterfront Resort. 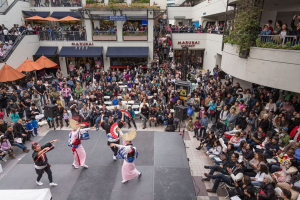 Oshogatsu Family-Festival Fun: With three different locations across Little Tokyo, experience all the magic of a traditional Japanese New Year. Enjoy an energetic day full of live entertainment, traditional food vendors, music and more! Presented by the Japanese Chamber of Commerce of Southern California, this can’t miss event will delight the whole family! Tuesday, January 1, 2019 from 10:50 a.m.-4:00 p.m. various locations, free. Weller Court, Japanese Village, and Frances Hashimoto Plaza. Delight in Delicacies: Stop by Tanota, one of Little Tokyo’s newest walk-up hotspots, for a popular New Years treat. As masters of takoyaki, a delectable snack traditionally filled with octopus, Tanota will be a featured vendor at the Oshogatsu Festival. Osechi ryori is a meaningful twist on the bento box – every dish within is imbued with meaning and meant to bring happiness and good fortune for the New Year. Murakai Market, open 9:00 a.m.—10:00 p.m. on New Years Day. Let Them Make Mochi: Japanese American Community Cultural Center’s (JACCC) annual day-long event for little ones inspires children’s creativity with the Children’s Oshogatsu Workshop. Lessons include modern calligraphy, gyoza-making, taiko drumming, t-shirt screen printing, and traditional mochitsuki-making! Reward a well-earned appetite with a bowl of buckwheat soba noodles at Suehiro Cafe, a classic dish to welcome in the New Year. Reflect and Remember: On New Years Day, participate in the time-honored ritual of Hatsu Goma (first fire rite) at the Koyasan Buddhist temple, and up until January 3 ceremonial charms and amulets are available for purchase to help usher in a fresh start. Remember hope and strength in the face of adversity at Gombatte! Legacy of an Enduring Spirit Exhibit at the Japanese American National Museum. Fascinating photographs of Japanese Americans detained during World War II highlight the sacrifices made and the rich legacy left behind. Koyasan Buddhist Temple 341 E. 1st St, Jan. 1-3 from 10:00 a.m.-5:00 p.m. The Celebration Continues: The festivities don’t stop on New Years Day! Venture back to Little Tokyo on January 6 for a stunning display during Kotohajime. In its 36th year, Kotohajime is a feast for the eyes and ears with visionary dance performances and mesmerizing music. January 6, 1:00 p.m., Artani Theatre, JACCC. Tickets available for $18 for JACC members and $20 general admission. Working at home surely requires a huge amount of self-discipline. Aside from effectively balancing work and family time, a constant challenge among home-based workers is to keep their workplaces clean and organized. Staying consistent can be particularly difficult for those who are in the comfort of their own homes. Now you have to remember that cleanliness usually promotes better productivity. If you want to increase your efficiency, ensuring that everything is orderly can be a huge help. You won’t experience difficulty locating a needed file, for example, anytime you need them. Take a look at your desk and decide what needs to be kept and what needs to stay there. You are probably spending long hours on your desk and so it is crucial that you feel comfortable there. Place unnecessary accessories or documents somewhere else. 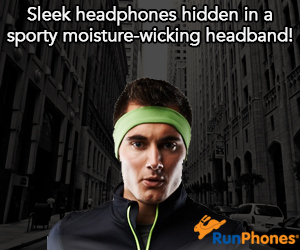 Also, resist the temptation of eating food on your table. Crumbs can attract insects while coffee stains can be difficult to remove. Do yourself a favor and go to the kitchen or dining area during short breaks. Despite the widespread use of emails and electronic files, it is not surprising that many offices still find it useful to keep hard copies of important documents and contracts. If the same is true for you, then make it a point to have an effective filing system. Use filing cabinets and folders for your advantage. You may arrange your files alphabetically, by date, or by client name depending on your preference. Whether you are using a laptop or a desktop, you need to make sure that it is always free from dust and dirt. Use a damp microfiber cloth to clean the monitor and keyboard. The same can be used for wiping your printer, scanner, telephone, and everything else. The trick for making your working environment more visually appealing is to create a place for everything. Therefore, dole out a place for each object and name it so that you may always recall where you have placed something. It is exceptionally important to clean the bathrooms or washroom as they are the home to destructive microscopic organisms and germs. Utilize scrub and liquid solution to flush the sink area alongside taps. Refill the fluid cleanser routinely. Wipe the floor and bowls with the compelling cleaner. 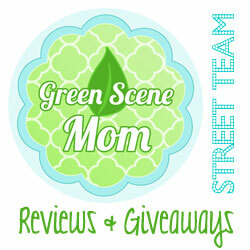 Install a room purifier or aromatic items. By following these practical tips, having a tidy home office will be possible for you. Of course, these cleaning routine duties should be done often for you to experience the big difference. Doing major cleaning tasks also needs to be done at least once a month. Cheers to the New Year aboard the magnificent Queen Mary, December 31, 2018. Take a unique voyage through history exploring the ship’s themed decks and ballrooms, brought to life with celebratory live music, DJs, dancers, dueling pianos and more. One of SoCal’s best fireworks displays will light up the night sky off the stern of the ship at midnight. Only on New Year’s Eve, the Queen’s Salon will transform into The White Canary, a glittering white party with a champagne tower centerpiece, martini contortion performances, flapper girls, and DJ Cutt spinning the soundtrack for the balloon drop at midnight. The Royal Salon has always been the Cat’s Meow, and for New Year’s Eve, will host the black light party, only lit by neon. Dance to electronic music with DJ Closa, grab a drink from LED bottles, as hula hoop and black light artists paint to the beats of the music. 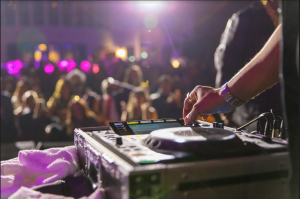 The true party begins on the Verandah Deck, also known as the Live Wire Quay, with non-stop performances by DJ Ravidrums, Rock It Bots, La Sonora Dinamita, and DJ Rod Epic. Experience Cryo Bots, LED features and dancers, and the famous synchronized fireworks show to ring in 2019. A secret location buried within the ship will host Capone’s Hideaway. This gem will be hard to find, but once discovered, step into a speakeasy with waterfront views, an authentic absinthe bar, and hot jazz. On the Ship’s Bow, head to the Hotsy Totsy party for live country music from Dean Kalogris and DJ Coral, with twinkling lights, moonshine and line dancing. VIP party goers will receive the Bird’s Welcome in the Brittania and Deck Salon. Experience tantalizing décor, sip on cocktails, and catch the Hells Belles Burlesque Show and performances by Dueling Pianos. Celebrate in VIP style at the Live Wire Lounge in the Verandah Grille. The cumbia inspired VIP lounge will host performances by DJ Rod Epic and Samba Girls, plus offer prime firework viewing. The Boiler Room brings a brand-new VIP experience to the historic inner workings of the ship, 25 feet below the water line. Transport back in time through swirling fog to experience the Hells Belles Cage Dancers, musical stylings of DJ Pharaoh, and Steampunk Jetpack cocktail artists, all in one of the most unique party locations you’ve ever seen. The Capstan Club offers an exclusive VIP experience and ultimate firework viewing location. Reserve one of eight cabanas on the Capstan deck and enjoy private seating, a bottle of champagne, exclusive bottle service, and music from DJ Malcolm Alxndr. Dining on board to celebrate New Year’s Eve is a five-star experience at Sir Winston’s Restaurant & Lounge, Chelsea Chowder House and Promenade Café, all offering specialty menus for the festive evening. Following the iconic fireworks display, starting at Midnight guests can indulge in classic breakfast favorites – buffet style – at the Midnight Breakfast in the Promenade Cafe. No reservations are needed and tickets start at $24. Keep the New Year’s celebration going through January 1, and indulge in our No Resolutions Brunch for the ultimate New Year’s Day buffet in the Grand and Windsor Salons. No reservations are needed and tickets start at $42. The celebration can truly last past midnight with a New Year’s Eve hotel package, which includes VIP passes to the evening festivities onboard. New Year’s Eve on The Queen Mary takes place from 8 p.m. to 1 a.m. Guests must be 21 years old to attend. Tickets are on sale now, General Admission tickets are $115 per person and VIP tickets are $215 per person. VIP tickets include a champagne toast upon entry, access to all parties plus exclusive ballrooms and prime fireworks viewing locations. Reservations are required for dining at Sir Winston’s. Private champagne cabanas with bottle service are available for reservations now. For more information, pricing, hotel packages and more, visit http://queenmary.com or call 877-342-0742.